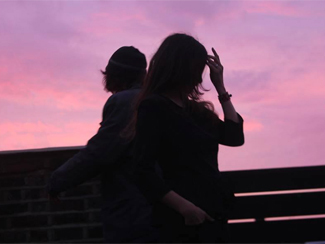 Keith KlenowskiWhile 2010 was unquestionably the year of The National with the release of their breakout record High Violet, the band haven’t been entirely quiet this year, continuing to tour and also releasing a couple of new tracks for soundtracks to various things. One of them was for Portal 2, which I’m led to understand is a video game; I’m still working on finishing Super Mario Bros so I’ll have to take your word for it. But rather than just put the song out there, the band and game producers made a proper single of it and enlisted fans to create and submit videos for the slow-burning, piano-led song and out of the 320 entries, chose two they found to be standouts – one featuring a sad lip-synching sock puppet and another animated in theme with the game – and awarded them first and 1.00000000001th place, with prizes awarded to both. The second place entry and other notable clips are available to view at the Portal 2 website. Girls have released a video for the first single from their forthcoming album Father, Son, Holy Ghost. It’s out September 13 and they play The Mod Club on the 27th of the month. Warpaint are re-releasing their 2010 debut The Fool in an inevitable deluxe edition come September 19, in the UK at least. The bonus incentives include the entirety of their 2009 EP Exquisite Corpse – which is absolutely worth hearing, even if it features actress Shannyn Sossamon on drums rather than current powerhouse Stella Mozgawa and also a re-recorded version of Billie Holiday, which is available to stream at Wears The Trousers. The Galway Advertiser has a feature piece on the band. Paste has put tUnE-yArDs on the cover of their latest electronic edition of their magazine. She plays Lee’s Palace on September 24. The London Evening Standard profiles Annie Clark of St. Vincent. Her latest Strange Mercy is out September 13. Cowbell has an interview with Stephen Malkmus, whose new album with The Jicks Mirror Traffic is out August 23. They play The Phoenix on September 21. One-time Guided By Voices member and rock journalist James Greer has posted recollections of the time GBV were being courted by Warner Bros to his blog. MTV talks to Hold Steady frontman Craig Finn about the decision to make a solo record, as he is for release in early 2012. Into The Woods has a video session with Okkervil River wherein they perform the B-side to their “Rider” single; the A-side of their new single is now available to download – the 7″ of which comes with another new song as the B-side – stream that one at Pitchfork. NPR has a World Cafe session with Jason Isbell while The Corner News and The Emory Wheel. A new MP3 from Blitzen Trapper’s forthcoming American Goldwing is now available to download. The album is out September 13 and they play The Opera House on October 30. Ryan Adams has confirmed an October 11 release date for his new solo record Ashes & Fire; Spin has details on the album and some of the guests who’ll make appearances. Blurt reports that Calexico are assembling a vinyl box set of their many, many (eight in total) tour-only releases. Entitled Road Atlas, the collection is being targeted for a Fall release. NOW talks to Dayve Hawk of Memory Tapes, taking the stage at Wrongbar tomorrow night around midnight. Singer-songwriter Sean Rowe returns to town for a show at The Rivoli on September 9, tickets $11.50 in advance. Spinner talks to Marissa Nadler, who has announced a Fall tour that brings her back to town for a show at the El Mocambo on September 13 with Irish singer-songwriter Vincent James McMorrow. She’s promoting her self-titled album, released earlier this Summer and has just put out a new video. With their second album Dracula set for a September 20 release, Portland’s Nurses have made a date at The Drake Undergroudn for October 19. Lauren DukoffOnly the most optimistic of souls think we’ll ever hear new material from Rilo Kiley; aside from rumours of a b-sides/rarities compilation, it would seem that 2007’s Under The Blacklight – on which they already sounded disinterested – will be the final word for the Los Angeles pop outfit. And while frontwoman Jenny Lewis has already established a pretty successful solo (and duo) career, former partner Blake Sennett is returning to active duty by turning his former side-project The Elected – last heard from on 2006’s aptly-titled Sun Sun Sun – into a full-time gig with Bury Me In My Rings, out next Tuesday. The album is currently streaming in whole over at My Old Kentucky Blog and it sounds as though Sennett is still content to mine the rich tradition of classic and breezy Californian pop – with a foray into funk that’s as questionable as any attempts at funk that can be described as a “foray” – for his purposes. His tunes were never the highlights of Rilo Kiley’s records – Lewis’ ascent to stardom over their run was impossible to eclipse – but he was always a solid tunesmith with a good sense of melody. Perhaps now, without having to be constantly measured against his bandmate, he can establish his own merits properly. He’s also taking his show on the road and that will bring him to Toronto’s Drake Underground on June 30. American Songwriter and Consequence Of Sound have conversations with Sennett about the new record and the latter gets a pretty colourful and definitive-sounding quote about the current (and final?) state of Rilo Kiley. 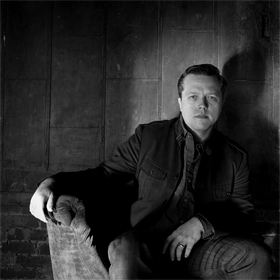 PopMatters and The News Chief have interviews with Jason Isbell, in town for a show at The Horseshoe on May 22. And Maria Taylor, who opens up that show and the tour for Isbell, has announced an August 16 release date for her new record Overlook. Details and a streamable new song over at Under The Radar. Rolling Stone talks to The Head & The Heart. The Fruit Bats have a new record in the can entitled Tripper, and will be sharing it with the world come August 2. Exclaim has details and a widget from which to download a new, non-album, J Mascis-guesting MP3. eMusic interviews Will Sheff of Okkervil River. They’re at The Phoenix on June 10. NPR has a couple notable World Cafesessions up for your enjoyment – one with The Mountain Goats and another featuring The Kills. Blurt profiles The Antlers, in town at The Mod Club on June 14. Spin and NOW talk to Death Cab For Cutie’s Ben Gibbard and Chris Walla, respectively. Death Cab are at The Phoenix on May 18 and the Molson Amphitheatre on July 29 and their new record Codes & Keys is out May 31. Daytrotter has posted a session with John Vanderslice. Metromix and CityBeat welcome The National back to Cincinnati. Captain’s Dead has unearthed an old 1988-vintage Uncle Tupelo demo tape and posted the contents online. Interview does its thing with James Blake, playing a sold-out show at Lee’s Palace on Saturday night. NPR is streaming a Lykke Li session from KCRW while Express Night Out has an interview. She’s at The Phoenix on May 22. The Alternate Side has a video session and interview with The Raveonettes, The Columbian just an interview. 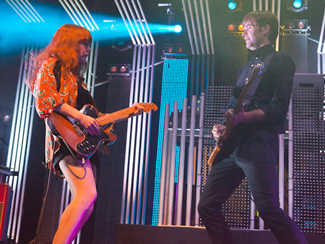 MSN talks to The Naked & Famous, back for a show at Lee’s Palace on August 9.